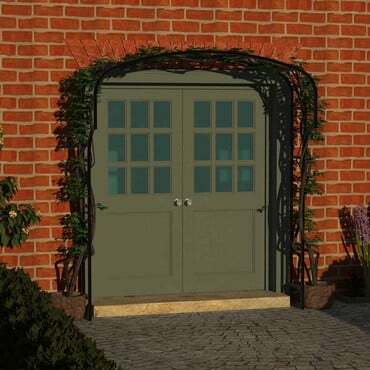 Our Ogee Door Canopies look beautiful over a doorway with the stunning curvilinear design giving real visual impact to any entrance, perfect for supporting fragrant climbing flowers. 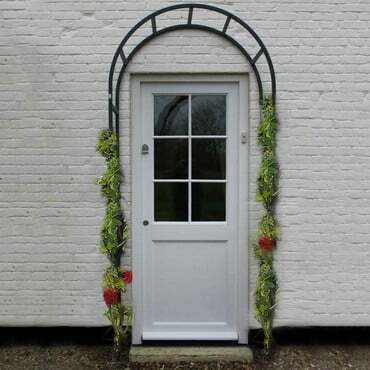 The Harrod Ogee Door Canopy, designed and manufactured by us in the UK and endorsed by the RHS, is made to the same exacting standards as our popular Ogee Garden Arches. 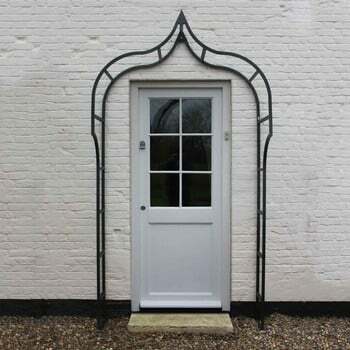 The Ogee Canopy is 1.5m wide and is made using the high quality steel square section, galvanised and powder coated matt black for a long lasting weatherproof finish, and carrries a 10 year guarantee. The canopy kit includes the canopy roof and one piece fully welded side screens that attach either side. 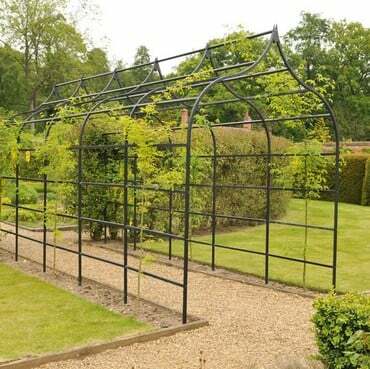 These full length side panels extend to the floor offering great support for climbing plants. Our durable, long lasting steel reinforced connectors provide ultimate stability and fit neatly inside the framework for a flush finish. The stainless steel bolt fixings have a discreet black coating. 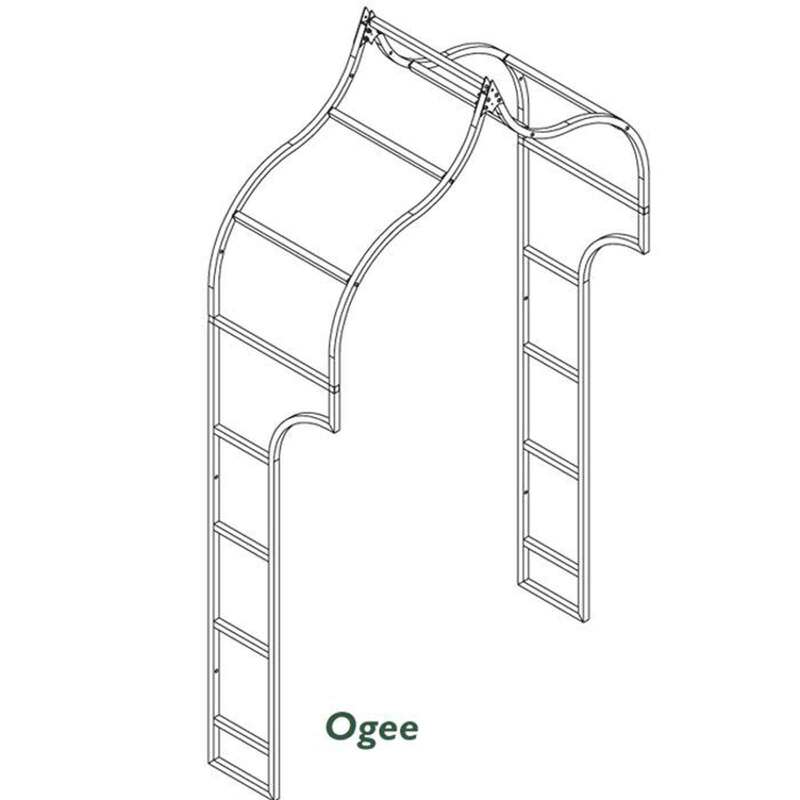 The Ogee Door Canopy is designed to be wall mounted via partially hidden stainless steel screws and rawl plug fixings. All fixings are supplied as standard with full mounting instructions provided. 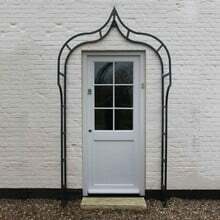 If you can't see the size of canopy that you are looking for we can design a made to measure canopy to fit your doorway, we can also make wider canopy tops available to suit patio and french doors.